In this two-part blog post my goal is to inform you about current, new and sometimes overlooked things from the world of Google G Suite. The first part looked at Gmail, tasks, notes and calendars. In this second part we'll take a closer looks at Hangouts Meet, Jamboard, Groups for Business, administrative functions, Google Forms and Google Sites. Since I previously looked at the apps and features used for personal productivity (although Gmail and Calendar are also useful for collaboration), let's take a closer look at the latest updates for Google G Suite that help you collaborate with your colleagues, and your clients. 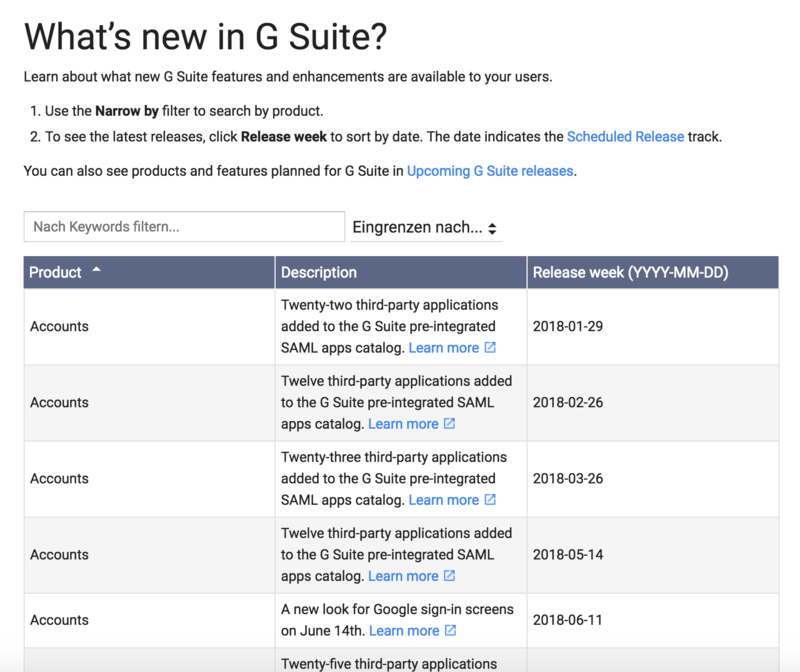 What's new in G Suite? provides an informative, quick overview of the latest changes made to Google G Suite. It's even organized so that you can sort and filter the Product, Description and Release Week columns. Each entry has a link to its corresponding post in the G Suite Updates Blog. What's new in G Suite? One of the reasons for moving to Hangouts Meet is that it uses the WebRTC protocol. Because of this, no plugins are required when using other browsers, such as Firefox. In order to attend a Hangouts Meet meeting, you don't need a Google account, but instead you only need a link to the meeting! U.S. dial-in numbers are available for all G Suite plans; international dial-in numbers are supported in the Enterprise plan and higher level premium plans. As a G Suite customer, you can still opt-out for now, but in the second half of the year Meet will have all the functionality of classic Hangouts; and at that time, Meet will be made the default for all users. A quick note on browser compatibility: Internet Explorer and Safari will also be supported in the second half of the year; support for Firefox starting from version 60 is also planned. At several meetings, however, I found that Firefox participants had problems receiving video. As a result, I looked into using other solutions such as Appear.in (a very simple and fast solution). Google is constantly working to improve and expand the Meet platform, especially with regard to its usability and support. By choosing and configuring the recommended meeting room hardware, like microphones, speakers and cameras, your next meeting will be problem-free. Support for "third-party" systems is increasing to integrate Hangouts Meet with other platforms such as Pexip or Logitech. It's always useful to be able to use the same whiteboard, even when you are sitting in another city or another continent. 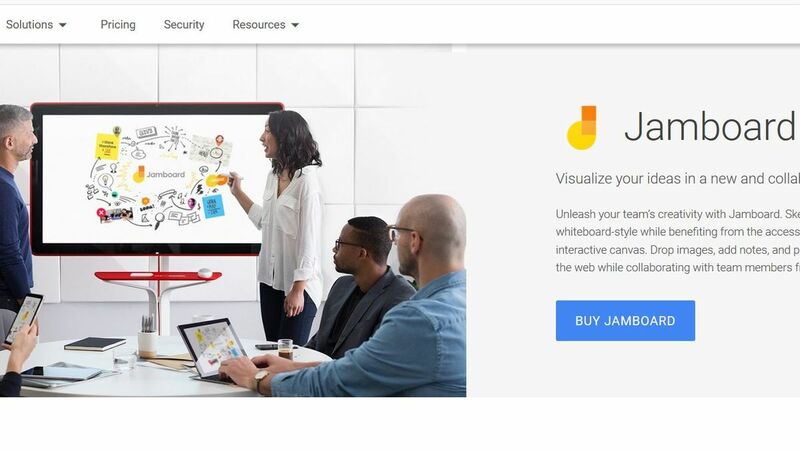 Last year, Google introduced Jamboard to do exactly that. At the moment, the $5,000 Jamboards are only available in shops in the USA and UK. 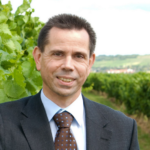 Having said that, with a bit of creativity you can get the solution in Germany as well. Jamboard mixes hardware, apps and the collaborative whiteboard service that it's named after. 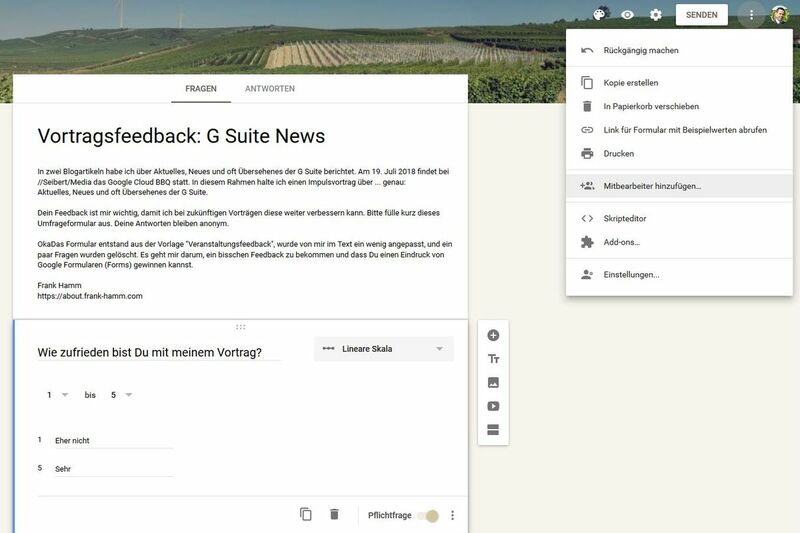 Jamboard is already included in the basic version of G Suite. Google is working hard to develop more features (white color brushes and bluetooth conferencing was announced in latest release of Jamboard). Google's motivation to develop this is probably in no small part due to the competition: for example, Microsoft already has its own solution on the market with the Surface Hub. Google Groups have been around since 2001, originally as a result of Google's takeover of the Usenet databases and its browser-integrated mailing lists. Google Groups continues to be very popular with some hobbyist and professional interest groups. What most people don't know is that Google Groups is also available to businesses as a part of G Suite - and in all G Suite plans, too. Discussion groups can be formed inside an organization, but external participants can join as well - for example: in support. Security and privacy settings are also available, but only for corporate use. From creating team mailing lists to processing support tickets to hosting internal discussions, many organizations use Google Groups to connect and collaborate in the workplace. But, as with any communication tool, it’s important that your settings deliver the right balance between sharing and security. It's important, especially in business situations, that administrators have settings and control options at their disposal. The central control hub for G Suite administration is the Admin Console. The Admin Console now includes a status report for all G Suite apps. The G Suite status dashboard can be viewed by anyone, giving the user an overview of whether one of your G Suite tools is currently affected or not. This is the place where you can check the status of your tools for any errors or glitches that might occur. Endpoint Verification collects information via Chrome extensions and native apps on users’ devices, and displays that information to admins in a new report in the Admin Console. Here's a good example: Say you want greater security for your employees' mobile use - a password policy can now be enforced on Android devices. Admin Quarantine helps your organization prevent spam, minimize data loss, and protect confidential information. G Suite admins can set up and manage quarantine policies to divert emails that pose a risk before they’re sent or delivered. They can then review those emails and take appropriate action to protect their organization and its data. Data from G Suite core services (for example, Gmail, Google Contacts, and Google Docs) will be exported for all users in your organization. Once your export is complete, you’ll receive a confirmation email with a link to your archived data in Google Cloud Storage. For security purposes, the archived data will only be available to the super administrators of your domain. Individual users in a company can download their data from the takeout page (but only if the G Suite administrator has enabled this feature). This takeout page is available for both G Suite accounts and Google's free personal accounts. I admit that I've never used Google Forms - at least not for creating surveys. Nevertheless, Google Forms is an easy-to-use tool for creating surveys and questionnaires. You can even collaborate on a customer survey and process it with several coworkers. To better integrate forms into the official company communication channels, there are some new branding options - for example, you can now easily add a logo. I took the opportunity to create a small feedback survey for my presentation at the Google Cloud BBQ on July 19, 2018 in Wiesbaden (in German). Usually, you can get this create and publish a Google Form in only a few minutes and with just a few clicks. Originally, Google Sites wasn't a viable option for me. It was too old-fashioned and somehow it wasn't at all the typical 'Google simple' I'd come to expect. Maybe I just didn't feel like dealing with it, because as a freelancer I like working with other systems like WordPress when I'm designing websites. But when your site only has a few pages, a couple paragraphs and not many photos, WordPress can feel oversized. Sometimes you only need just that: a few pages, text, images and possibly a few embedded documents which can be edited by colleagues. We’re making it possible to copy a site created in the new Google Sites. Sometimes you want to work on a new site, but you don’t want to start from scratch. By copying an existing site, you can save time by reducing duplicate work and avoiding manual copying of existing sites. 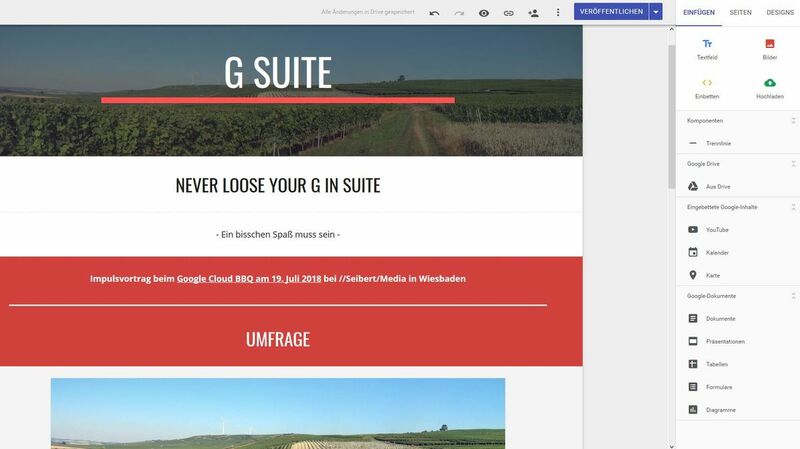 Since I didn't have a website yet, I created one - for my presentation at the aforementioned Google Cloud BBQ on 19 July at //SEIBERT/MEDIA: https://gsuite.frank-hamm.com (site in German). Each website can have its own subdomain within a domain configured in G Suite.